Get ready to discover the truth about the DB Release 3. Want to know if the Diamondback Release 3 matches the hype? The brand has said themselves that the Release 3 is the best trail bike they have ever put out. I wasn’t sure that I believed it until I rode it myself. I know that it can be confusing to read through short or vague reviews. I wanted to lay it all out for you in an in-depth manner, so you can see for yourself in this Diamondback Release 3 review if the bike is all that it is cracked up to be. The Diamondback release 3 uses cutting edge full suspension technology and is made for all mountain riding. As I poured through the reviews, I found more and more that I liked about this bike, but the clincher was riding it myself. If you’re in a hurry and just want to see the best price for the 2017 DB Release 3, we got you covered! Click here to see the best price for the Diamondback Release 3. 1.2 What Is the Diamondback Release 3? 1.6 What Makes This Trail Bike Unique? Full suspension bikes are more complicated than hardtails. The frame design allows for the front and the back of the bike to move as two parts joined by pivots. The frame models have changed a great deal over the last several years, and it can be hard to keep up with all of the latest innovations. But if you want to go after a bike that will get you the most enjoyable ride possible, it is important to find the right fit for you. The bike that you buy will be based on your capabilities and skill as a rider, and what you are looking for from a ride. A high quality full suspension bike like the Release 3 is ideal for people who want to tackle terrain that can get bumpy. They want to be able to do technical climbs without losing traction and momentum. If you are a rider that wants to get the most momentum out of each pedal, and you rarely go on bumpy or technical terrain, a hardtail bike might be a better fit for you. Also, if you value simplicity and don’t want to deal with upkeep and maintenance of your suspension system you should steer clear of the full suspension options. Do you like to stand or sit on downhills? How important is pedal power on your climbs? What are you willing to spend to get the bike of your dreams? What Is the Diamondback Release 3? The Release 3 give you the ability to conquer varied, all mountain terrain without problems. The 2017 Diamondback Release 3 mountain bike is Diamondback’s latest and greatest in the Release model. They’ve tweaked the front suspension fork, rear shock, gears, and the brakes. The overall outcome is a bike that can handle a large variety of terrain and is extremely durable. This bike will take you anywhere you want to explore, which is nice for those of us that want to go big! Suspension: dual suspension. 130mm of travel in the rear, a Level Link suspension platform, and a RockShox Pike RCT3 Fork with 150mm of travel. You can see from the specs that this bike is a beast of a unique breed. 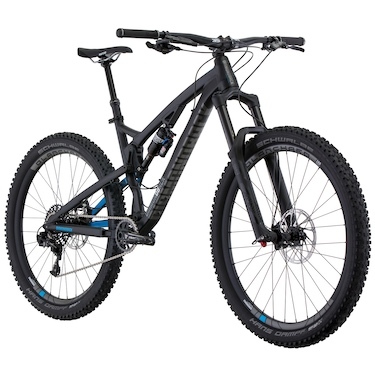 It is built to handle spicy downhill routes with the 150mm front suspension. It is in the same family as the other bikes in the Catch and Release line up, but different in several fundamental ways. For me, it stands apart from the Catch model because it doesn’t rock the fat tires. 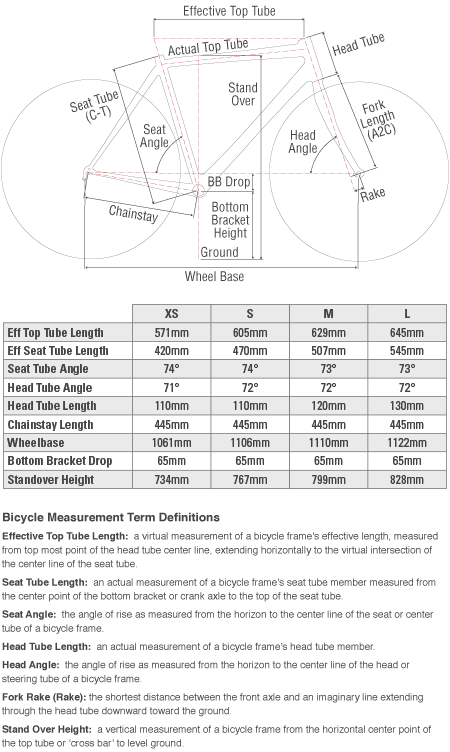 The Catch has tires with a width of 3.5”, which is almost inching it into fat bike territory. In contrast, the release 3 has narrower 2.35” tires that don’t stay as glued to the ground. The slim tire is great if you like to have a play full ride, and want to be able to feel light and pop up over obstacles. It also stands apart from the Catch model because of the 150mm front suspension capabilities instead of the 130mm of the Catch. That means it can handle even more aggressive downhill riding! Wear your helmet. But the fun of the Release 3 doesn’t just come from the downhill riding. It’s a great bike for climbs too. Throughout the evolution of the Release bike, it seems that the engineers have been perfecting the dual suspension design to give the bike maximum efficiency on uphill climbs. 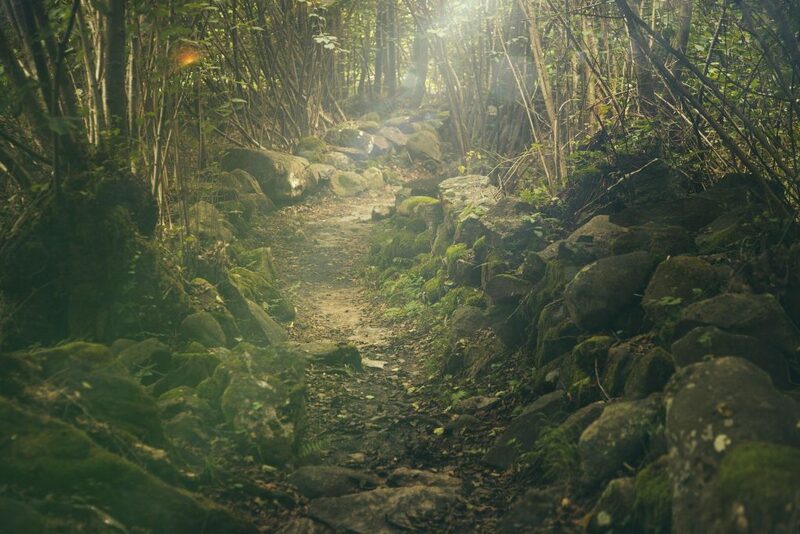 With the Diamondback Release 3 even the toughest terrain will be as easy as this path. That is ideal for those of us who want to get the most momentum out of each pedal stroke. I enjoy climbing, but I hate having to get off of my bike to walk. I want to be able to make it up any ascent that I venture onto. The engineers behind the Release 3 design decided to change up the brakes. Instead of the Sram Level T hydraulic disc brakes of the Release 2, the newest version has Sram Guide RS hydraulic disc brakes, which is an upgrade in my book. The Release 3 is designed to tackle any trail. It has a mix of suspension that gives the rider a smooth experience over rocks, roots, and drops. The stiffer back end suspension allows for more power on the uphill climbs. The dual suspension allows the bike to stay glued to the terrain on uneven sections, which gives the rider more momentum and balance on technical uphills. This design is best for a rider who plans on getting into challenging and technical territory and wants to handle it like a pro. The Release 3 comes with some awesome features and benefits. Let’s take a look. This feature is one of the things that makes this bike great. Diamondback engineers worked with the existing VPP design and improved it by making the front section sit perpendicular to the back part of the pivot joint when the bike is weighted. The unique suspension platform design makes the bike feel like you are getting more forward momentum with each down thrust on the pedals, instead of feeling like your movements are inefficient. The RockShox Pike RCT3 that makes up the front suspension is more than capable of taking on some rocky terrain. I like to ride a bike that can handle bouncing off of logs and step like rocks without jostling me out of the saddle, and the front suspension on the Release 3 can keep me seated. The RockShox Pike fork has 150mm Travel. The SRAM Guide RS hydraulic brakes are top of the line and make for an effortless braking experience. You won’t be pumping the brakes fearfully with these puppies under your fingertips!They react quickly to the touch and give you a lot of precision and confidence on the downhills. These lightweight wheels are superb. 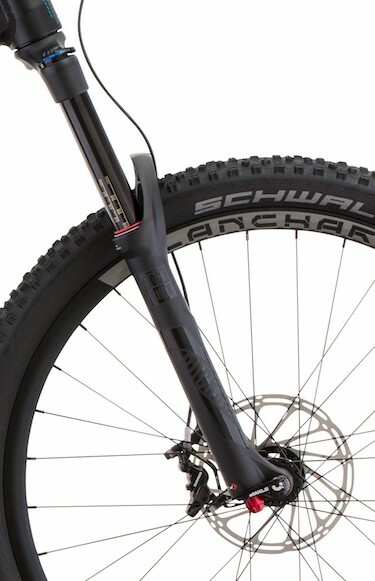 The Schwalbe Hans Dampf tires are mounted onto Blanchard rims. The rims are lightweight and have a large internal width. They are designed to make transitioning to tubeless tires a breeze. The seat is on a KS LEV Integra Dropper, which makes for a lot of exciting riding options. I like the feel of dropping the seat on fast winding downhills, or whenever I feel unstable. The reduction lowers my center of gravity. Always a plus when you are pushing the limits of your riding capabilities! What Makes This Trail Bike Unique? Among the many trail bikes that are out there, this bike stands out for a few key reasons. The geometry of the aluminum frame aims to work well with the Level Link suspension. It has a short back side and a longer top tube than you might expect, but the result is a balanced feel. The front link and back link that manage your gears line up in a straight line when the bike is weighted. This lineup allows for efficiency with each pedal stroke and cuts down on that pedal bob feel that so many dual suspension bikes have. The choices that the bike designers made when putting together the Release 3 are very admirable. The bike might be put together on an aluminum frame, but the drivetrain, brakes, and seat post are all top of the line, making the bike a blast to ride. I am the first one to give a bike upgrades, but this bike doesn’t need them. That condition is rare for the price of this bike. Usually, for a bike of this mid-upper level, you could expect to make some upgrades pronto. The bike is on sale for $3,900. I’ve looked through many user reviews for the Release 3, and it seemed that a lot of the riders were impressed with the bike. This review by Bike magazine highlights the fact that the bike was composed for rough terrain. I think that says a lot about the bike’s design and high-end components. I also read a review from Bike Radar which described the bike as capable, with proper handling. I found these reviews to be encouraging. Every rider has a different style, and it’s nice to know that people who enjoy challenging terrain like the way this bike handles. You never know when you’ll make that leap to the next level as a rider. That’s particularly the case when you get a new bike under you. The Release 3 is capable of being “nimble at speed,” and ready to take on technical trails. Even if you aren’t there yet, you want a bike that can grow with you. Pop up over rocks, catch a little bit of air, and push yourself to take those turns a little bit faster! The reviews showed me that the Release 3 could handle it. Like I said, every rider deserves a bike that is just right for them. If you think your riding style is calling out for a different model, try to pinpoint what it is that you think needs to be different. Here are some suggestions. Diamondback Catch 2017: If you are looking for a bike with fatter tires than the Release offers, consider the 2017 Catch model. This gives you a tire width of 3.5”, which is pretty darn fat! You’ll have tons of bounce and surface area, which is helpful for cushioning drops as well as biting into loose surfaces. The Catch has less travel in the suspension and comes with Shimano brakes. 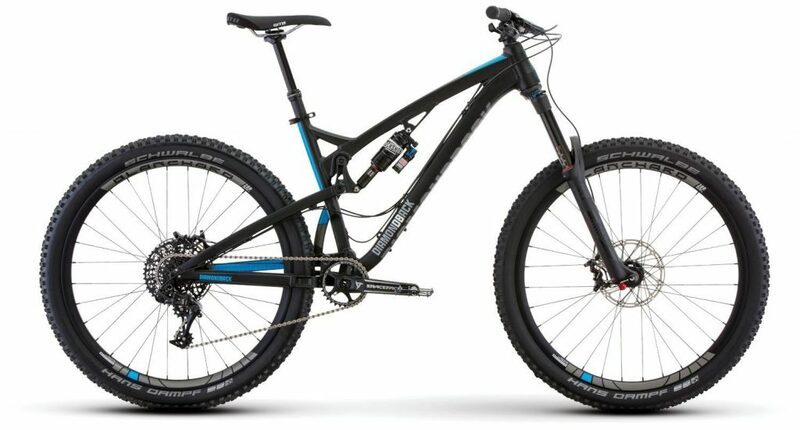 Diamondback Mission 1: The Mission 1 is a hearty, adventurous bike comparable to the Release 3. It’s made with Weapons Grade aluminum and has durable Fox parts in the front and the rear. This offering from the Diamondback team is also an all mountain full suspension bike but has 160mm of travel on the front fork. If you are worried that the 150mm of travel on the Release 3 won’t do it for you, consider the Mission 1. Click or tap here to learn more about the Diamondback Mission 1. Diamondback Release 2: The Release 2 is an excellent alternative to the Release 3 because it stays true to the principles of the bike, which is a design that maximizes the Level Link suspension platform technology. The Release 2 features a few different parts including SRAM DB5 disc brakes and a SRAM GX type 2.1, 11- speed drivetrain. If you love the concept of the Release 3 but want to explore your options regarding specific components, then be sure to check out the Release 2. Riding a bike that is holding you back will affect your progression as a rider. If you are passionate about your sport and want to have consistently epic days out on whatever trails you choose then get a bike that can keep up with your desire for adventure. Some bikes limit you. The right bike will open up your options and let you get the most out of your rides. The Release 3 is a bike that will take you through varied, all mountain terrain without problems. It can handle the bumps and obstacles you want to get over but doesn’t bounce and sag as some full suspension bikes do. Riders who want to keep their momentum on steep climbs will love the Level Link suspension platform and unique geometry that Diamondback has come up with this time around. Your front and back wheels can bite into the trail as you move over uneven surfaces. The parts are top of the line for the price. The frame is aluminum, which some people might balk at. At the same time, it’s durable, capable, and agile when you want it to be. For me, it’s a dream to ride. I think you’ll feel the same. So be sure to check it out. Click Here To See The Diamondback Release 3.